Throughout the summer months, many top college players join club teams to hone their skills and stay sharp against fierce competition. As summer play heats up and the 2017 USA Rugby Emirates Airline Club 7s National Championship approaches, the Chicago Lions look to capture one of the two qualifying spots out of the Midwest region. As one of the premiere club teams in the Midwest, the Lions attract college talent from schools throughout the region. These college standouts are selected by former USA Eagle and current Lions 7s Head Coach David Fee on the criteria that they can add quality talent and depth to the Lions and may join Lions 15s after graduation. From Indiana University, the trio of Tyler Sousley, Alex Dorrier, and Jake Hidalgo are each contributing to the Lion’s run at a national title. After helping lead Indiana to a Big Ten Championship in the fall, the three Hoosiers, each in their first year with the Lions, are getting their first taste of club competition. Both Sousley and Hidalgo tore up the competition at Grand Rapid 7s on July 22, notching several tries each as Chicago took first-place in the tournament. Grand Rapids 7s acted as the Lions’ final tune-up before the Midwest Regional Championships. On July 29 in Cincinnati, Ohio, the Lions will look to lock up an 11th straight appearance at the Club 7s National Championships. Overall, Chicago has 15 appearances at 7s Nationals, with one national title in 2007. The Lions’ fourth-place finish last year was their best since 2013. Several D1A players were able to make a smooth transition into Club 7s by meeting up with the Lions for Vegas 7s in March. Both Dorrier and Hidalgo joined the Lions in Vegas, helping Chicago win the Aces Division Championship while experiencing their first national club competition and beginning to build chemistry with the rest of the team. Also making waves for the Lions this summer is Lindenwood University fly half and recent Collegiate All-American 7s First Team selection Nick Feakes. 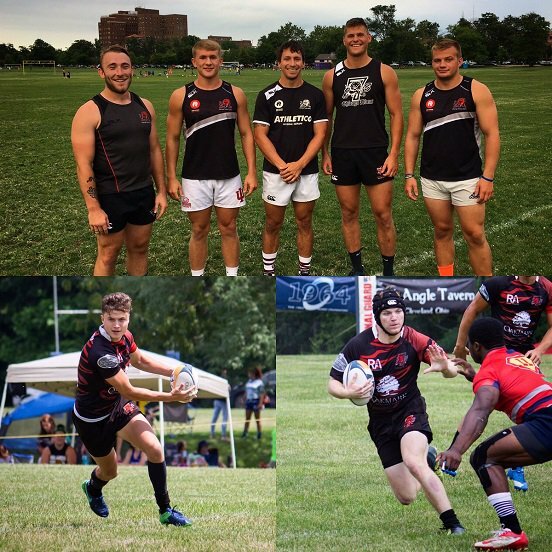 After being named MVP at the 2017 Men’s Division I College 7s Championships where Lindenwood took home the national title, Feakes rejoined the Lions for his second summer, in search of a second national title in a matter of months. Alongside the trio of Hoosiers and Brady Gent from rival Davenport University, Feakes has quickly become one of the offensive standouts for the Lions. Last year, Feakes was named to the 2016 Club 7s Dream Team while Gent was selected as part of the College 7s National Championships Dream Team. Though the D1A players come from all different areas and talents, they’ve found a way to bond and mesh together on the Lions. Even rivals like Feakes and Gent have come together after many battles on the pitch with their D1A squads. For more information on everything Club 7s, including 2017 National Championship seeding and schedules, visit usaclub7s.com.